The recognition of corporations as the subject of criminal punishment has been discussed along with the pros and cons since the origin of criminal law only recognized persons in term of flesh and blood as the subject of criminal punishment. All crimes in criminal law originally could only be perpetrated actively or passively by natural persons, because only the natural persons who have both capability to act physically (actus reus) and freedom to decide so that they have the culpable mental state (mens rea). Indonesian criminal law system develops its unique approach to address corporate criminal liability by recognizing corporations as the subject of criminal punishment in various special Laws since 1951. Since then, the recognition takes place outside the KUHP. As a consequence, several problems have emerged during the development of corporate criminal liability system in Indonesia. On the other hand, the contemporary Dutch criminal legal system has recognized the criminal liability of corporations within its main criminal code since 1976 in one single stipulation and has succeeded to develop the system in establishing the actus reus and mens rea of corporations. With a comparative approach, this study aims at mapping out problems faced by Indonesia in developing the system of criminal liability of corporations and offering solutions to improve the way to establish the criminal liability of corporations. This study comes out with an analytical critique on the way Indonesia developed the system in establishing the criminal liability of corporations. 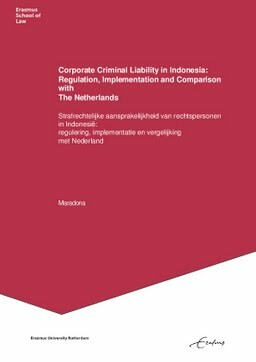 This study also provides recommendations on how Indonesia should improve the criminal liability of corporations system using lessons learned from the established systems and theories among countries, especially the Dutch criminal legal system as the root of Indonesian criminal legal system.